The Grundig G3 shortwave radio. 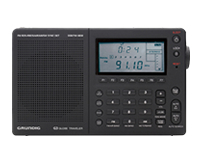 The Grundig G3, one of my favorite full-featured portables, is now on sale at Universal Radio for $89.77. The G3 would make an excellent gift for someone in your life who is interested in shortwave radio. I recently updated my review of this radio and even included it in our annual gift recommendations. Not sure how long this sale will last. This entry was posted in Radios, Shortwave Radio and tagged G3, Grundig, Grundig G3, Universal Radio on December 15, 2012 by Thomas. Nice deal for the holiday season. Been looking for a small SW radio to listen to in the evening time that i could put by my bedside. THanks for sharing this.